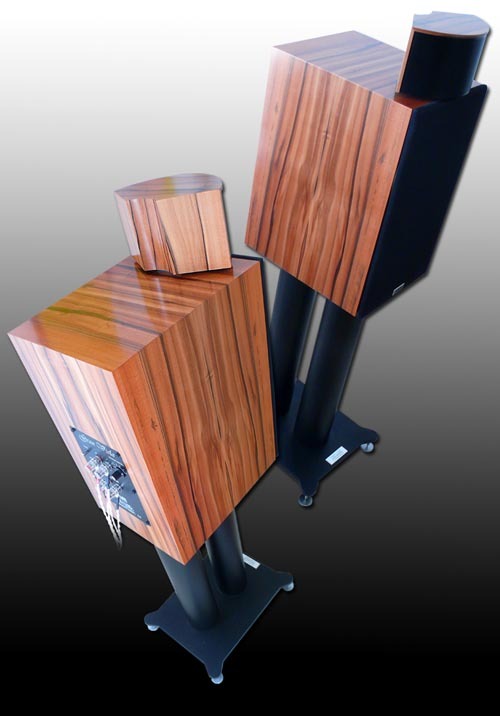 During my time with WLM's Grand Viola Signature MkII flagship speaker, I'd e-mailed company boss Hannes Frick. My personal pair of Diva Monitors had developed far better snap, crackle and pop in the vital 100-300Hz band for a drier, faster and more dynamic response that outperformed the somewhat overdone, ponderous and slower character of the big 2.5-way pack leader. Less woof, more bite. Hannes and designer Martin -- I couldn't see but hear it loud and clear -- were scratching their heads. Surely I'd lost my senses. Why'd they author a flagship model, then send it to a reviewer owning their entry-level monitor without knowing that the floorstander would be victorious? However, the rules of engagement had me pen what I heard, not should have. Upon return receipt of my loaners, Hannes fired them up in his system, then rushed them to Martin in Vienna. Shared verdict? During the add-on hours my review process had accrued, the intended low-pass frequency for the second woofer had shifted upwards "by about 15 cycles". The staggered widebanders had fleshed out far more than anticipated, producing more bass higher up than the network anticipated. The Austrians confirmed my review conclusion. Suddenly, the Grand Viola Signature MkII was back on the drawing board. Rather than a mere rework of the crossover, the more expensive Legend driver -- visually reminiscent of the Zu unit and selected by WLM for its MkII models -- was ditched for the prior Eminence Beta I'd secretly suspected was the superior driver at least in this implementation. Meanwhile my Divas had returned to Austria, taking up Hannes on a far earlier offer. If my long-planned eventual encounter with the Super PAC-equipped Grand Viola floorstanders had me lust for Martin's coup-de-grace tweeter system, Hannes would take back my Divas. He'd swap me a pair of GV Monitors for the price difference. So I expected a new but same-sized box with the new whizzer-fitted deeper Legend driver. Instead, it was a very welcome deja vu for the Beta. The upgrade simply stripped the coaxially mounted phenolic tweeter from behind and replaced it with the external twin-tweeter Signature system. A new filter dropped the crossover point from 1,500Hz to 800Hz and added a bypass capacitor over earlier SuperPAC versions. For expanded flexibility especially for future reviews, Hannes had also added the optional active switch. This allows bypassing of the internal crossover to actively biamp with WLM's outboard filter and compensation network. i.e. analog bass boost in passive monitor mode to compensate for the Beta's 50-ish roll off and extend response to 32Hz without a sub. So I'd also sent my Series V 'electronic brain' back to Schützenauer. He upgraded it to Series VI status for the fully loaded, all-in-one solution WLM primarily sells to its dealers for utmost demonstration flexibility. 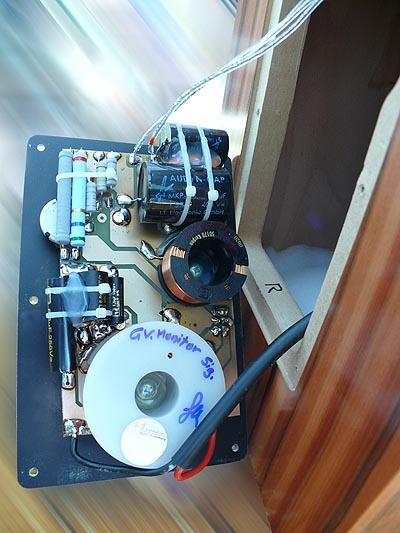 Especially analog bass boost in passive drive is a useful amplifier test. It increases LF amplitude which places more strain on the amplifier (the right-most section of Sys VI is the add-on over Sys V). Unlike most reviews, this one is about personal property. That makes it a foregone conclusion in many ways - except that my purchase was predicated solely on prior ownership of the Divas and review exposure to the Grand Viola MkIIs. Those exposures had combined in an imagined grafting triumph: Diva + GV tweeter. The tale is whether it delivered, not the cost to get there. 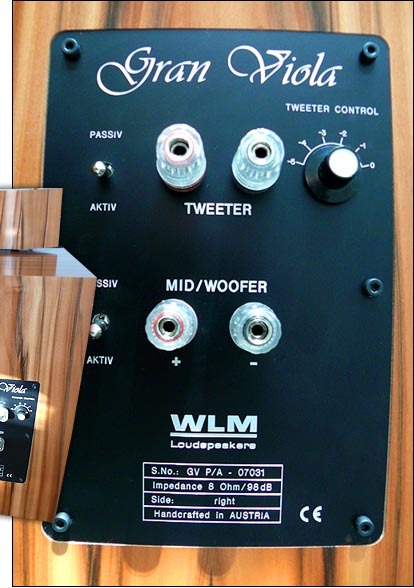 Suffice to say that for what it is (always code for, what's in it), WLM's Grand Viola Monitor Signature belongs into the ultra exotic cable category - very expensive. Like certain superfi cables can, in the right system, be worth their wallet cramp when you focus solely on sonic performance, this speaker sounds worth the labor your greenbacks represent. In a harmless hobby, what floats your boat needn't be rationalized to any disbelievers. 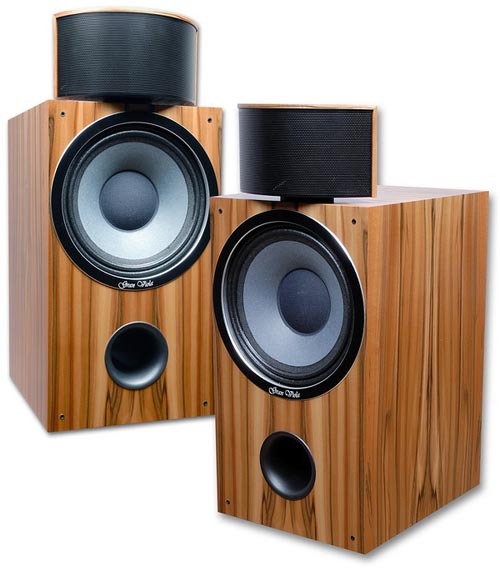 shrinks the main speaker chassis to generate more upper bass pressure and less cabinet talk while room placement consideration are dominated by best staging rather than avoidance of LF room modes. For ultimate performance, one runs this system fully active. This requires three stereo amps (tweeter, midrange, woofer) and an external crossover. It also filters out bass data from the monitors for superior dynamics rather than running them wide open. Ultimatized, this approach is 180 degrees out of phase with minimalism and low box count; but fully aligned with maximum adaptability (shy of DSP equalization - WLM's compensations are fully analog). 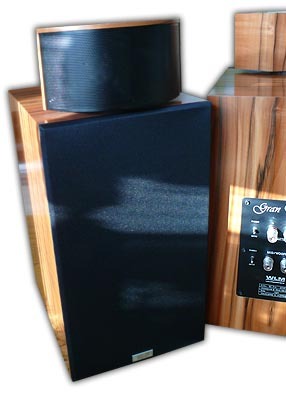 The sympathetic reader may appreciate how the multi-faceted usages this speaker system affords could appeal to a reviewer, with bandwidth-limited amplifier testing just one option of many. 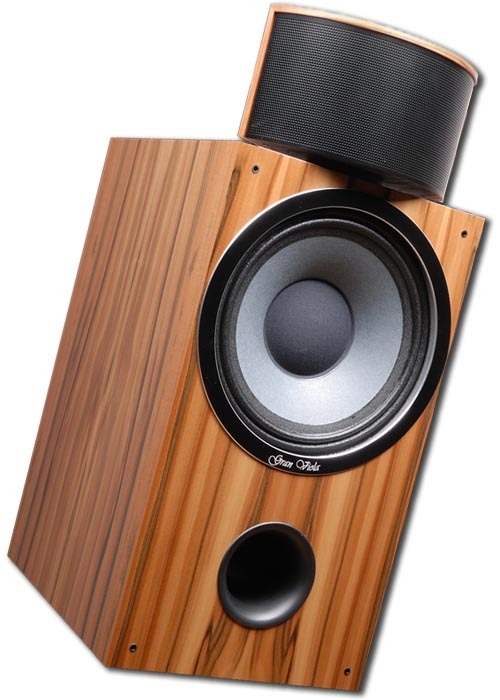 The speaker's claimed 98dB sensitivity is friendly to low-powered amps and points at the need for electronic LF compensation without a sub. To make the Beta driver extend deeper on its own would have lowered sensitivity. The choice was for higher sensitivity, less bass extension. The optional Diva Control is the in-line solution (between pre and amp, CDP and integrated or in a tape loop) which applies an inverse boost to the monitor's native roll-off at the bottom. Naturally, stand-mounts perch on stands. That's a further expense to make today's commentary anything but a max return on least investment. It's not until you hear just how convincing the simplicity of modest ingredients comes together that you'll appreciate this system enough to shrug off related costs. Make no mistake, it'll take an experienced and self-secure audiophile already weened off material glitz and imposing cosmetics to even consider this setup. Even then it'll never ring the register as an ultra-competitive value. In this category, Zu's new Presence seems primed to hog that spot. As a satisfied owner, my writeup for once isn't concerned with competitive pricing. Chances are, if you can bankroll €13,000+ for a true 20/20 fullrange speaker system, you'll have your own ideas. Your eyes could be set on a famous brand's hi-tech gleam, not WLM Grand Viola Monitor Signature + stands + system control + Duo 12. Or as Blondie put it so laconically to Tuco: "There are two kinds of people in the world, my friend. Those with loaded guns and those who dig. You dig!" In the movie, that was no question. But here it'll be. And fittingly so. Nobody holds a gun to your head or runs a noose around your neck to make you buy anything hifi. In a salute to The Good, the Bad and the Ugly, here's the final shovel on why digging out this relatively no-name grave can unearth highly rewarding loot in a classic hifi climax. 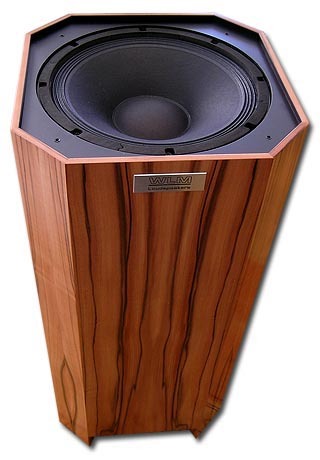 On specifics for the GV Monitor, there's a veneered Birch Ply core just as the subwoofer uses (there hardwood cross braces are added between the longer panels). My veneer of choice is Tineo or Indian Apple but many others are available. To the inquiring flashlight, the treble module consists of two outward angled, approximately 2" paper tweeters loaded by precision-machined, wide but short-flare metal horns. The Signature version of the PAC tweeter is larger than the standard one and benefits from tighter pair matching (100 raw drivers will net a mere 4 - 5 Signature PAC pairs). Phase, acoustically corrected is how designer Martin Schützenauer refers to his tweeter, with a claim for more accurate imaging whereby treble data arise as though from a singular and central point source in the room rather than as an approximate area suggested by the approximate summing of two widely spaced loudspeaker sources. 98dB/1m/1w sensitivity; 8-ohm impedance; 3.5 - 250-watt recommended amplifier power; 32Hz to 25kHz frequency response with Passive Control; 23.4" x 10.43" x 13" HxWxD (595mm x 265mm x 330mm); 44lb (20kg) each. A few words on the veneering: besides being pair-matched, the heavily figured wood pattern continues unbroken from the left cheek across the top and down the right cheek. This level of finish artistry is reminiscent of a bespoke tailor who has the pin stripes of a suit line up on each seam. On speakers, it's not something you see every day. With discrete left/right units that should not be confused to optimize staging, setup relies on a provided alignment guide which orients the SuperPAC modules to aim at the listener's ears in a predetermined angle. BluTac is provided to firmly seat the speakers on your stands of choice (WLM can sell you some excellent ones from their German supplier). Can modest ingredients done up right be delightfully upsetting to the glitz merchants and their fawning acolytes?